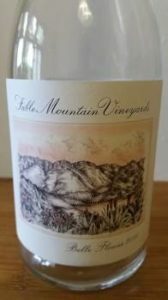 The Belle Flower 2014 from Tulbagh cellar Fable Mountain Vineyards, with the pink colour of the wine mirroring the winelands sunset depicted on the label, is a finalist in this year’s Wine Label Design Awards (vote for your favourite here) but what of the wine inside the bottle? W.O. Swartland, it’s a blend of 40% Grenache, 32% Syrah and 28% Mourvèdre and was aged for 12 months in concrete egg. The nose shows rose geranium and red berries plus a little spice and earth. It shows pure fruit and bright acidity. Not without palate weight given an alcohol of only 12% alcohol and about as serious as rosé gets. Price: R140 a bottle. One to try.. current go-to Rose (when occasion calls for it) is the Waterkloof Circumstance. But that is a 100% Mourvèdre instead of a blend.